Stages in the process of “Dream Journal” include (L to R) the original pencil sketch, a photo of the model, and the final digital painting. I translate messages from the metaphysical realm into the everyday world, through the medium of digital art. When I create, I am often in a mystical or transcendent state. I enter and maintain this state as much as I can because it keeps open a clear channel between the metaphysical guidance I receive and the tools in my hands. My aim is to carry the Vision as clearly and powerfully as I can with the technologies at my disposal. These include drawing, painting, sewing and costume making, directing, photography, studio lighting, digital image processing, and writing. My artwork often looks photographic, though I’m less interested a capturing a single “perfect” moment than in synthesizing portals to transformative experience. My background is in hand-drawn animation (line-and-cel), followed by 3D computer animation and special effects. Much of my fine art process follows a similar path to digital filmmaking and CG movies. Did you know that you can get a poster of “Dream Journal” (artwork shown above)?! In the early days of computer animation, I had a Janus-like role serving the client’s wild imagination on one side and the computer’s unforgiving rigidity on another. Art-making is similarly two-sided. 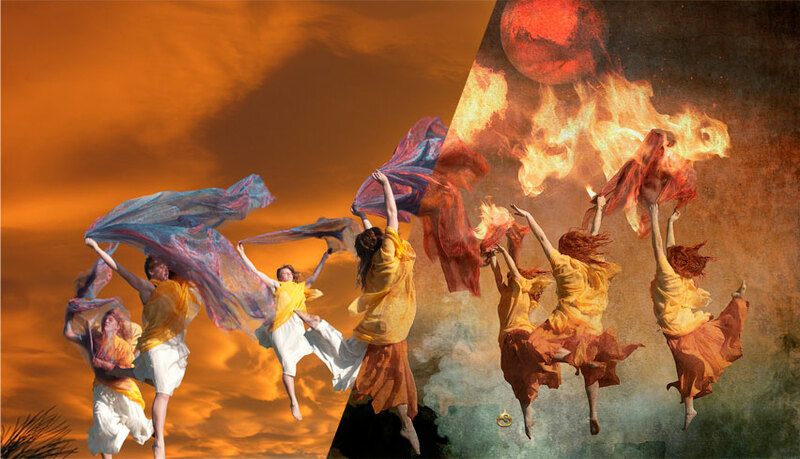 On one hand, I serve metaphysical guides whose instructions are pristine and staggering, while on the other hand, I’m devoted to transporting, healing, and uplifting you, the viewer. Being an artist means I am an apothecary, formulating visual medicine for people’s souls. The only way I can make the medicine is to taste it myself, like a good cook. My work is done and the healing complete when people receive and respond to the metaphysical message in body, heart, mind, and soul. In the next sections, I’ll explain in more detail how my creative process works, which methods I use when—and why—and give you some examples. My artwork begins with a mystically inspired Vision, which arrives unexpectedly—often while I’m doing some mundane thing like cooking, walking, or watching a show on Netflix. My spirit guides give pretty clear instructions. Typically, an artwork and its meaning appear to me in full detail before I create it. I believe it pre-exists in a perfect, etheric state and my job is to use every means available to translate it into our realm. It’s a daunting task, so I’ve had to develop dozens of skills, from photorealistic drawing to technically rigorous special effects photography. I’m okay with a “Renaissance” approach, though. I’m deeply inspired by Leonardo da Vinci, the master of every technical and artistic skill of his time. His love of life, combined with his giftedness, illuminates across the centuries and makes me try my utmost. So I accept that learning curves and technical challenges never stop in digital art. I hurry to capture the Vision in quick pen sketches and notes. These scribbles inform the composition and placement of key symbols. I may draw more realistic shaded pencil renderings to study lighting and texture. Sometimes I scan these drawings and they become final elements in the piece. 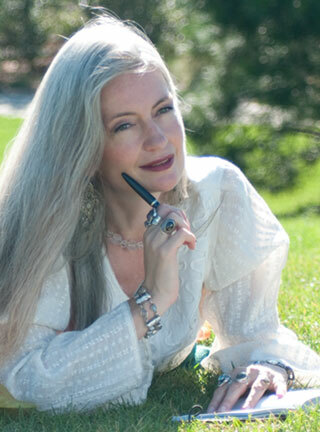 Click here to see how my visions work for YOU in readings. Writing and sketching shuttle me between worlds. Because I am interested in synthesizing metaphysical spaces and worlds, I begin with physical reality. This stage is like theatre or film production, in that I work with “talent” (the industry term for actors or models! ), costumes, sets, and props. Much of my artwork involves characters—mystical, human and animal. I love working with professional actors, dancers and athletes equally as much as “discovering” regular folks who have never modeled before. I look for a particular aspect of movement and personality, physicality and style that expresses the Vision, and then I approach that person to pose. Some “poses” I’ve asked models to do include jumping on a trampoline in full costume, riding double horseback, swimming underwater in an evening gown, or clambering down a cliff while holding a lantern. Now “Burning Down The House” (the artwork shown above) is available as a poster. People who end up in my artwork don’t just “look” the part – generally, they are attuned to what I’m doing and respond well to direction. I’ve directed a range of talent, from famous actors like Ellen Burstyn, all the way to toddlers. I love working with “real people” because we’re all traveling through life together and everyone has something to give—and something to receive in their own journey. I either create by hand or scavenger-hunt the costumes and props from thrift stores. I enjoy sewing and have made garments for everyone from queens to waifs. I’ve fashioned wings for angelic beings, trappings for horses, and objects like banners and cushions. I have a large wardrobe with wigs, jewelry, cloaks, makeup and masks. Each character calls for a particular look. I style the outfit and props to suit each model, and I often ask the model to choose what he or she prefers, so his or her performance is more profound and authentic. a woman resting on grass, a stubble field in winter, and hands crocheting (bottom right). 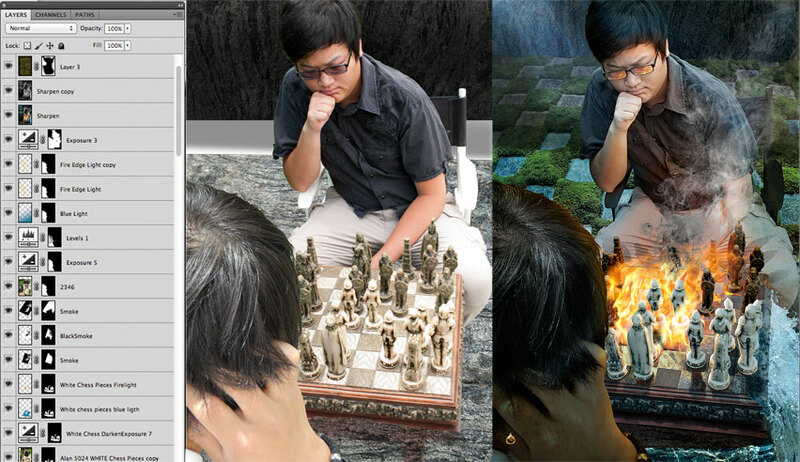 The direction of light from right to left is consistent through the photos – a secret of digital compositing! I use photographs as though they are complex “paintbrushes.” Each photo I capture has the symbolic content or tactile texture necessary to express the metaphysical idea. I take an animator’s approach to photography: my goal is a series of “key” frames or definitive moments in a sequence. I think of photography as recording a stream of moments while my subject emotes the essential feeling. The subject may be a human or animal, the behavior of light on a landscape, or abstract patterns caused by wind. The photos are “ingredients” in an alchemical recipe. Intuition is equally important as experience and trust of the metaphysical guides during this process. Depending on the piece, I look for a suitable location in Nature or an urban environment. Lighting is crucial to expressing the Vision, so I wait for the right time of day. I usually work outside year round, with the heaviest production in late spring through early fall. I use a Nikon D-300 with various lenses, a Coolpix P510, and my iPhone. I take a decent camera everywhere and have travelled to Asia and Europe—mostly to teach digital art! Studies include close-ups of textures and lighting effects such as fire, water, crystals, and clouds. Certain cosmic messages require controlled lighting that isn’t possible outdoors. For celestial beings in outer space or characters in metaphysical realms, I shoot against a black or white cyclorama with studio lighting to get a hyper-realistic, credible look. I’ve also shot green screen. In addition to my own photos, I collaborate with other image specialists or request permission to use extraordinary image sources, mostly from visualization science. I am fascinated by ways to record phenomena we can’t normally see, like xrays, extreme space probes, super high-speed photography, electron microscopy, and imagery made from shifting invisible data into the visible spectrum. The artwork “Patchwork Earth” (shown above and below) is available as a large, framed, one-of-a-kind Mystic Mural™. Contact me to inquire about adding it to your collection. A look at the digital lighting in “Patchwork Earth” starts with just a few of the eighty-nine layers in Photoshop (left). The elements are arranged in the rough composition (middle). They work spatially, but are not yet integrated by consistent lighting. Notice the light and shadow effects in the final rendering (right), including warm light on the hand from the fire ball (lower left), strong shadows cast to the left of the grass patch, and an overall warming tone that integrates the elements into the same space. The light and shading are hand-painted to give a super-realistic final appearance. At this point, I assemble the raw pictorial ingredients in Photoshop. First, I mask out elements and compose the image. I do a rough positioning pass, keeping in mind where I want the lightest vs. darkest points to be, how I want the viewer’s eye to move through the picture, and how I plan to integrate the details into a coherent and seamless whole. Most of my artwork has between 30-100 layers of photo elements, textures, hand-drawn details, and lighting effects. Throughout this process, my spirit guides whisper to me. I get inspiration and often run outside with my camera to capture images I didn’t know I needed until partway through. Compositing is meticulous and painstaking. I cut filaments such as hair, fur, or leaves from their context in the original photo and work with delicate transparencies to keep everything natural and realistic. Pieces with many figures take the most time and tend to have the most layers. One of the final stages involves integrating all the elements into the same space. I use color and lighting effects to smooth the image into a whole. I hand-paint the light using my knowledge of cinematic lighting and special visual effects (VFX). This includes key lights, diffuse colored gels, secondary reflections, cast shadows, rim light, radiosity, atmospheric phenomena like smoke and rain, and other subtle effects. My aim is to make a visually seamless world or environment, so convincing that the viewer’s consciousness is drawn into the metaphysical experience. Finally, there comes a moment when I know it is done. It’s a quiet, subtle and intuitive feeling that I have learned not to mess with, or I risk overworking the piece. Still, there are small details I see only after I have “finished” and I may go back for a few strictly limited touch-ups. Check out the Mystic Portal™ POSTER collection for more examples of Sonya’s most well-loved artwork. (Center) The rough composite. Source photos are in their final positions. (Right) The final artwork. Notice firelight reflected on the player’s glasses, chess pieces reflected in water, and the overall ambience of the environment.